Though fulfilled in the Maccabean Wars of the second century B.C., Zechariah 13 has elements that are typological of Christ and perhaps other first century events like the Jewish War with Rome. 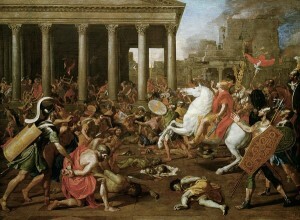 The Destruction of the Temple at Jerusalem. by Nicolas Poussin. (Gemäldegalerie, 1638-1639) Kunsthistorisches Museum. 1“On that day a fountain will be opened to the house of David and the inhabitants of Jerusalem, to cleanse them from sin and impurity. 2“On that day, I will banish the names of the idols from the land, and they will be remembered no more,” declares the LORD Almighty. “I will remove both the prophets and the spirit of impurity from the land. 3And if anyone still prophesies, his father and mother, to whom he was born, will say to him, ‘You must die, because you have told lies in the LORD’s name.’ When he prophesies, his own parents will stab him. Fulfilled! Zechariah 13:2-3 Commentary: During the Jewish War many People were coerced to act as Prophets predicting Victory for the Jews. Israel’s defeat exposed these Men as False Prophets. Josephus states that the leaders of the Jewish rebellion bribed or in some way coerced a number of people to pretend to be prophets. These people were instructed to predict that God would deliver the Israelites from Rome in order to inspire courage and prevent desertion. These prophecies proved false. God did not save these people from the Romans. The Roman army eventually conquered Jerusalem and its temple; and there was not a “place in the city that had no dead bodies in it, but [the city] was entirely covered with those that were killed either by the famine or the rebellion.”[ii] In the following verses, did Zechariah also foresee the lament of these prophets commissioned to predict lies? The siege of Jerusalem.Hayez, Francesco. 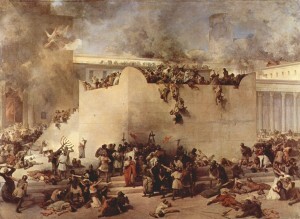 The Destruction of the Temple of Jerusalem. 1867. Galleria d’Arte Moderna, Venice. Fulfilled! 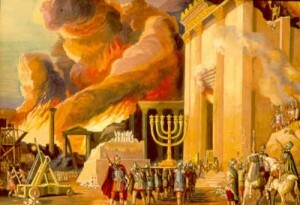 Zechariah 13:4-6 Commentary: Were These Wounds Battle Scars or Signs of Forced Coercion? Having witnessed the consequences of their deception, these false prophets compelled to prophesy are seen sorrowfully admitting that they are not prophets. Perhaps the wounds these prophets received in the house of their friends are battle scars incurred while present in the house of the Lord–the temple in Jerusalem, the fortress in which many of the zealots put up their last stand? Or maybe these wounds were incurred by forcible coercion on behalf of the leaders of the Jewish resistance? Fulfilled! Zechariah 13:7-9 Commentary: The Shepherd is Christ. 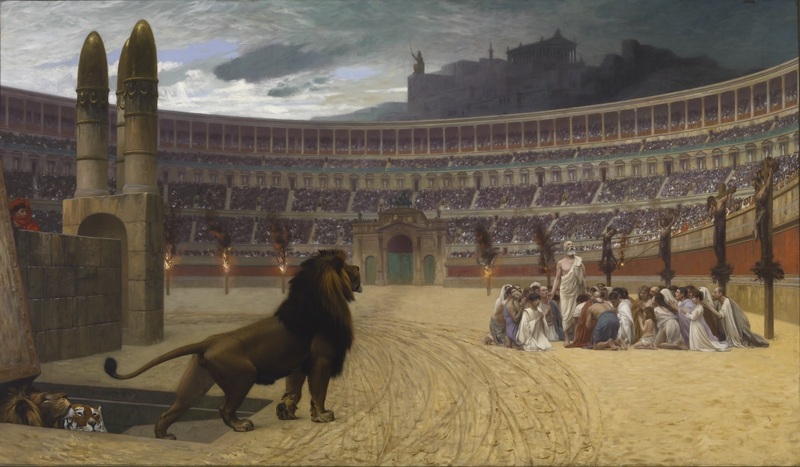 After Jesus’ Crucifixion, Christians were persecuted in Israel and Rome. Though it is likely that v. 7 was initially fulfilled in the death of Judas Maccabees during the Maccabean Wars, the shepherd in this chapter seems to typologically point to Jesus Christ. Either way the sheep are the people of Israel, and the sword in v. 7 is the word of God (Hebrews 4:12). It was the will of God that the Messiah should die for the sins of His people (Isaiah 53:10). After Jesus’ death, Jewish Christians faced many hardships. 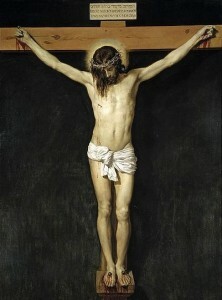 Shortly after the crucifixion, Jewish Christians were persecuted by their brethren in Jerusalem (Acts 8:1-3). Then in A.D. 64, Nero burned Christians on crosses and fed them to wild animals in public spectacle. Two years later, Israel revolted against Rome and thousands more Jews were killed. Though the exact number killed during these hardships is not known, in this oracle Zechariah implies that only one-third of the people living in Israel survived these calamities. [i] Josephus The Wars of the Jews 6.5.2. In the above commentary on Zechariah 13, Zechariah seems to predict events in the Maccabean Wars in a typological way pointing to Jesus Christ and possibly the Jewish War with Rome as well.